Handsome upright 5-7'x7' shrub with large pink-red/white flowers and deep green leaves. Lignotuberous. Flowers best in full sun. Grows well in most well-drained light or heavy soils. Tolerant of frost and extended dry periods once established. Excellent hedge or screen. 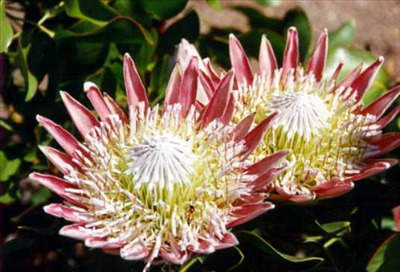 The South African national flower. Growing well in Ojai and grown commercially for the cut flower market.